"Our history with debuts is strong. It's a good place for significant athletes. They can throw the pressure of time out the window and just race. Shalane is a racer." - ING New York City Marathon director Mary Wittenberg talking in a Boston Globe article on how Shalane Flanagan will as expected make her marathon debut in New York this fall. For her part, Flanagan says, "I would love to win another Olympic medal, but more than anything, I would love to win a major marathon." Mary Decker's 3:57.12 - will it go this year? Boards: NCAA Shot Put mismeasured? Should Florida have won? Florida's Mesic: "I'm third, but they put me at fourth. They did a mistake, the officials. I cannot believe it, that that happened at nationals." Andrew Wheating became the first male in over 25 years to win the 800/1,500 double, Texas A&M got their 2nd-straight team double, David McNeill showed again he has a better kick than Sam Chelanga and a record number of fans saw the 2010 NCAA championships in Eugene. Plus, AJ Nation came up with a ridiculous kick to put the icing on the cake for Oregon's milers and Calvin Smith almost set a world record trying to win the title for the Gators in the 4 x 4. 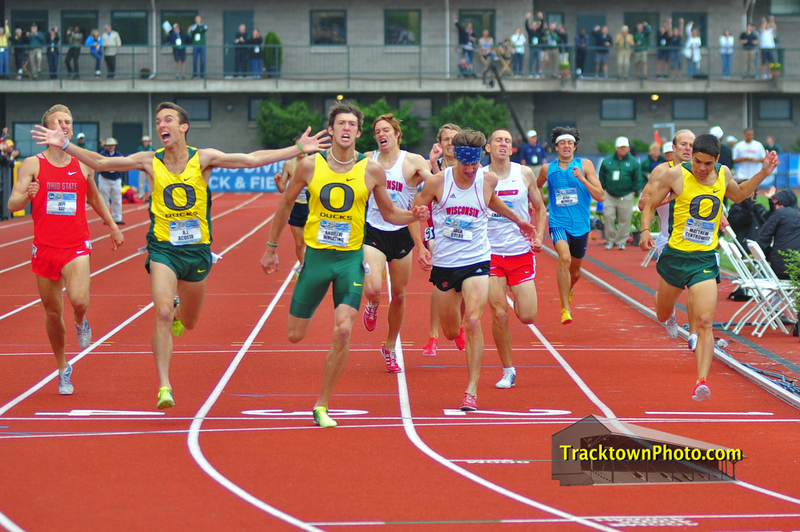 *Record-Setting Oregon Crowd Wows Athletes The crowd was packed and into it all weekend. *Queen Harrison First Woman To Win Both Hurdle Events At NCAAs Whiting, Wheating, Koll and Okagbare were the other double individual winners. *More Quotes From Ron Bellamy's Article On Meet-Defining 1,500m Final It did look like AJ could have won it but who wouldn't start celebrating if they knew their team was going 1-3 at NCAAs? LRC Day 3 Recap - Wheating!!! Saying he'd never been more nervous for a race, Andrew Wheating delivered the goods in the biggest race of the 2010 NCAA championships by winning the 800m final by over 1 second in 1:45.69. Lisa Koll also came through with a big win as she did what even Sally Kipyego couldn't and won the 10k/5k double, causing NCAA XC champ Angela Bizzarri to sit down on the infield with 1,400m to go. Other winners included Phoebe Wright, Jeff Demps in a sub-10, Ashton Eaton barely missing the NCAA decathlon record and Matt Hughes in the steeple. *Boards: Robby Andrews ran a horrible final We love that 1 guy stayed up until 2am in England to watch this race. Andrews told us afterwards that he just didn't have it (which is what it looked like, as he would have been crazy to stay in last place with 200m to go while Wheating was 1 second ahead of him). NCAA Day 2 Recap - Chelanga Wins Big, 1,500 Finals Set Sam Chelanga didn't wait as long as Lisa Koll to make his move, surging to the front after 2k and obliterating the competition for his first NCAA track title. The big surprise was tall sophomore Luke Puskedra surging with Chelanga in an attempt to help his team get some badly-needed points. The strategy didn't work but it was the only gutsy move of the race as the other guys played it conservative. Check out our 1,500m semifinal recaps and the interesting tidbits from Day 2. 800 final tomorrow! LRC Andrews 1:45.54! - 800m Semifinal Recap In one of the first races of the day, Robby Andrews won a super-fast first 800m heat (5th was a non-qualifying 1:46.19) in US junior #3 1:45.54. 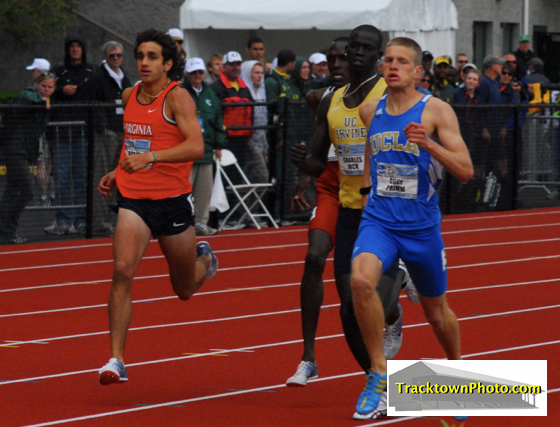 LRC Day 1 Distance Recap - Koll Dominates 10k After the race, it was hard to tell if Koll had just completed an easy tempo workout or an NCAA 10k final. Next up for the NCAA 10k record holder and 2-time champ is a showdown with Illinois' Angela Bizzarri in Friday's 5,000m. Koll's teammate Betsy Saina was 2nd while Nicole Blood responded to the home crowd to get 3rd. LRC Wheating, Eaton And Track Town Buzzing For NCAAs The press conference proved mildly interesting as Wheating says he'd be "thrilled" to get a shot at Robby Andrews and Oregon/A&M coaches, irked over regionals, aglow over great fields set for Eugene. *Andrews: "He who kicks last, wins ..."
*Ex-Duck Coach Martin Smith Doing Well At Oklahoma Smith was run out of Eugene but it's been a win-win for both the Sooners and Ducks. Looks Like The Saga Is Over ... Continues? Caster Semenya Press Conference Cancelled At Last Second We had speculated she was coming back to competition as IAAF head Lamine Diack was going to attend. Now we have no idea what is up except that Diack is in S. Africa for the World Cup instead of in Rome for the Diamond League. Shalane Flanagan Will Make Marathon Debut In NYC The Olympic 10k medallist realizes it's time to try to the marathon. *Message board thread on this here. Athens Olympic Marathon Victor Mizuki Noguchi Plans Comeback Given the poor state of women's marathoning right now, we can see why she's tempted to come back. Future Marathoner: Lisa Koll One Of 3 Finalists For Broderick Cup The award comes out Monday is given to the collegiate woman athlete of the year. Tyson Gay: Talk Is Cheap; It's Time For Me To Put Up (And Beat Bolt) Or Shut Up On beating Bolt: "I have to do it or shut up." Even World Cup Stars Love Bolt: Steven Gerrard Really Looks Up To Usain Bolt - "He's a winner, an inspiration, a character and someone I love watching." Gerrard sent Bolt his jersey but is upset that Bolt is a Man U fan. Jamaica's Jermaine Gonzales Ran 44.79 In France A PR and #3 in the world as he beat a tired Angelo Taylor. LRC $20,010 Prediction Contest Recap A former 800m runner for Frank Gagliano's Georgetown Hoyas came out on top of our NCAA prediction contest. The top 5 were filled out by a genius, a current D1 runner, an ex CU buff, and a high schooler formerly coached by American record holder for 800m Johnny Gray. USATF Coaching Registry Labeled "Blackmail"
In order to get a coaching pass for the USATF meet this year, any US track coach now has to go through the coaching credential process which involves a 5-fold background check and signing a code of conduct. The USTFCCCA has issued a statement saying they neither support nor helped develop the program, while longtime USA Coaches Education leaders resigned this year as the USATF developed this program. Texas Decision Keeps Nucleus Of Big 12 Conference Intact Colorado (and their XC team) will join the PAC-10, which is now expected to go after Utah as the 12th team. Reports indicate money, not a distance running super conference, were the principal motives behind the move. Caster Semenya To Join 3-Week Training Camp Put On by Her Sports Training Academy Semenya is the president of her academy and bringing in young South Africans to train. Abubaker Kaki Runs 1:43.48 In Turin He backs up his 1:42 defeat from Oslo. Max King And Sopagna Eap Win Inaugural USATF Half Marathon Trail Championships In Bend, OR King is heading east this weekend for the famous Mount Washington Road Race. Lukas Verzbicas won the Jim Ryun mile in 4:04 while Bernard Lagat showed he's lost a little speed in the 1,500 (and Manzano ran 3:33). Christin Wurth-Thomas was the only runner in the hot women's 1,500 to go with the rabbits but got swallowed up by Nancy Langat and the field nonetheless. World track champion Linet Masai won with a very fast 30:48 while World XC champ Emily Chebet was 25 seconds back. Golden Gala Roma Recap There were 6 world leaders in Rome. Lashinda Demus was probably the performer of the meet with a 52.82 400m hurdles that's only half a second from the WR. Asafa Powell ran a world-leading 9.82 to win the 100m by a big distance. In the women's 800m, Halima Hachlaf, who had never broken 2 before, ran a world-leading 1:58.40, as Maggie Vessey ran a solid 2:00.73 but only finished 9th as 6 women, including two from GBR, ran under 2. The men's 5,000 was a crazy race that went out too fast and had a mad sprint finish which went to Imane Merga in 13:00.12. 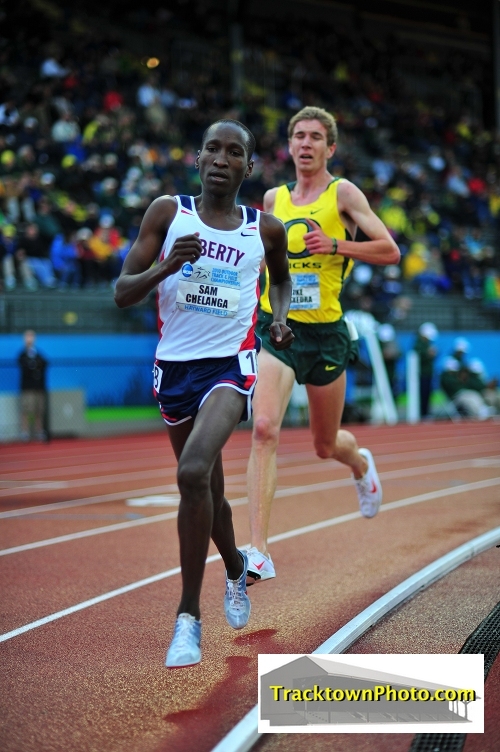 Augustine Choge won the 1,500 in 3:32. Milcah Chemos Cheywa put on a furious finish to win the women's steeple in a world leader. A great women's high jump and a Jeremy Wariner world leader. *Why isn't Rupp in the Rome 5,000 today??? LRC NCAA Predictions Who Will Win NCAAs? We show you the LetsRun.com fan votes from our $20,010 Prediction Contest. Want to see how you're doing? Check scores here. 7 people are still in contention for the $20,010. We're fortunate to be heading to Eugene to cover the NCAA championships starting Wednesday with Andrew Wheating and Robby Andrews in their 800m semifinal heats and Lisa Koll in the women's 10k. Can the Ducks rise to win team titles in front of big home crowds? We give you our individual predictions, tell you who's running each event, and introduce the big stories of this year's Hayward Field Championships. Flagstaff Survivor Contestant Matt Smith Wins Christchurch Kiwi Marathon Go back to 2002 in the LRC archive to learn about Flagstaff Survivor. Piece On Brandon Bethke And David McNeill - NCAA 5,000m Could Come Down To ASU, NAU Duo Add a guy named Chelanga to that mix.